I grew up in Mumbai’s moderate (often hot) temperatures and extremely humid climate. Despite having lived for 12 years on the East Coast of America, I fancy going into hibernation each winter. I am a prime example of that over-bundled person you spot on 65-70 degree F day. Considering our winters are a lot colder, I am usually missing in action or devising ludicrous plans to stay warm. On my extensive list of tricks to stay warm, the realistic plan of “consuming copious amounts of hot beverages” ranks right below the unfeasible plan of “staying indoors”. During the day I imbibe abundant cups of hot tea and coffee and in the nights I indulge in my love for red wine. Last winter, I was at a holiday party where the hostess served Mulled Wine and it took just a sip to conclude that it would become my favorite (alcoholic) winter drink. Mulled wine (also known as Glögg or Gløgg) is a traditional winter drink in Europe. It is usually made with red wine along with various winter spices and served hot or warm. “Mulled” in this context implies heated and spiced. 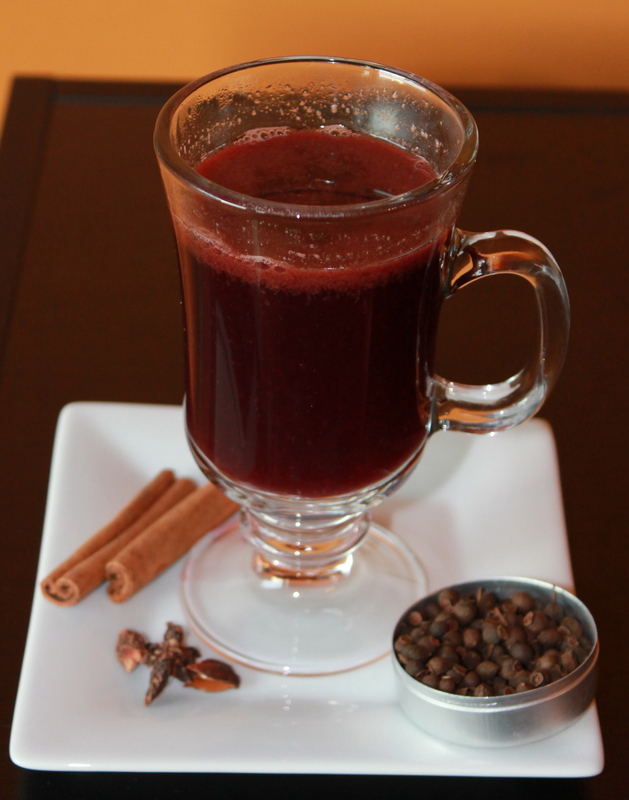 Similar to Sangria in the summer, mulled wine with its combination of spices and honey augments the fruit of the vine. I found Ina Garten’s recipe online and after a few attempts of adding and subtracting ingredients, this derived recipe is my favorite version. This is also a great way to give new life to a day-old opened bottle of wine. This drink guarantees to warm you and your friends up, while adding to the holiday cheer. Fresh apple cider can be found in the refrigerated juice section of all major grocery stores during apple season (Fall/Winter). If you are making this at another time of a year, use shelf-stable apple juice or shelf-stable apple cider. 1) In a large pot combine the wine, apple cider, cinnamon sticks, orange zest, orange juice, cloves, star anise, allspice berries and honey (per taste). Bring to a boil on medium-high heat. 2) Once it reaches a boil reduce the heat to low and heat for 10 minutes. Taste and add more honey if you want to make it sweeter. 3) Strain and pour into mugs or other hot beverage safe glasses. Add an orange peel or cinnamon stick to each mug to garnish. Serve warm. We constantly hear “eat your fruits and vegetables” from multiple sources. We are also aware that a balanced diet with generous amounts of fruits and vegetables reduces the risk of chronic diseases. Yet more than often we do not follow this advice. Our excuses for disregarding this recommendation range from being too busy to simply despising the tastes of several fruits and vegetables. Drinking juices or smoothies is a fast, easy and appetizing approach to consuming more servings of fruits and vegetables. Juices and smoothies are a great start to a day or a healthy and energizing snack before or after a workout. It is also a crafty medium to disguise less appetizing vegetables through tastier fruits, satisfying the palates of even finicky eaters. 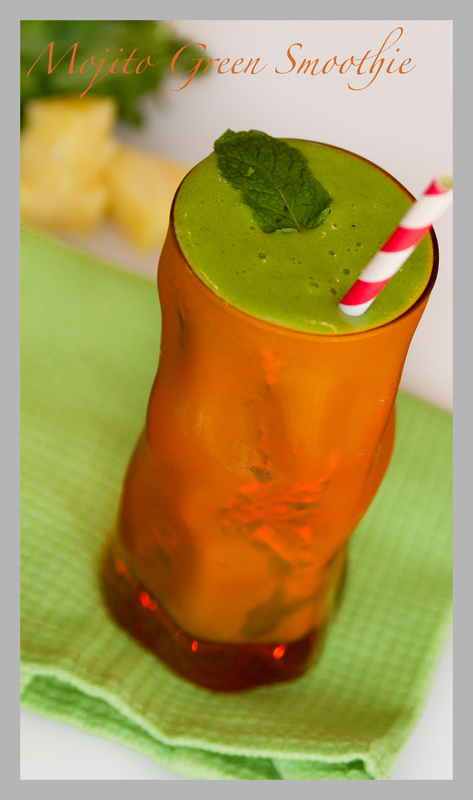 My friend Sneha, recently shared some of her delectable smoothie recipes with me. Given my love for mojito’s this was the first smoothie recipe I gravitated to and have made it regularly for the last one week. Since today is Sneha’s Birthday, it is the ideal day to share her recipe and to introduce you to her astounding photography: http://www.flickr.com/photos/ssenjalia/. If pineapple is in season you can use fresh pineapple chunks. If you use fresh pineapple, just add a ¼ cup of crushed ice to your smoothie to chill it. You will need lesser coconut water if using fresh pineapple and crushed ice. You can use kale in place of spinach. I used packaged coconut water. If you have easy access to fresh coconut water, then I recommend using that. 1) Crush the frozen pineapple chunks in the blender. 2) Add all the other ingredients and blend everything together till you achieve the consistency of a smoothie. If you prefer a more liquid consistency add a little more coconut water. 3) Pour into a tall glass and enjoy.